Lisa and I had dinner with Gregory Benford and his wife when I visited U.C. Irvine a couple of weekends ago, and he raised an interesting point. 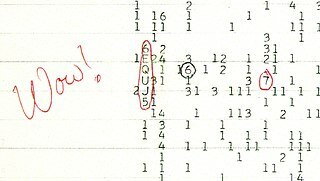 So far, radio searches for extraterrestrial life have only seen puzzling brief signals – not long transmissions. But what if this is precisely what we should expect? • Gregory Benford, James Benford, and Dominic Benford, Searching for cost optimized interstellar beacons. As an example of using cost optimized beacon analysis for SETI purposes, consider in detail the puzzling transient bursting radio source, GCRT J17445-3009, which has extremely unusual properties. It was discovered in 2002 in the direction of the Galactic Center (1.25° south of GC) at 330 MHz in a VLA observation and subsequently re-observed in 2003 and 2004 in GMRT observations (Hyman, 2005, 2006, 2007). It is a pulsed coherent source, with the ‘burst’ lasting as much as 10 minutes, with 77-minute period. Averaged over all observations, Hyman et al. give a duty cycle of 7% (1/14), although since some observations may have missed part of bursts, the duty cycle might be as high as 13%. Even if these are red herrings, it seems very smart to figure out the cheapest ways to transmit signals and use that to guess what signals we should look for. We can easily make the mistake of assuming all extraterrestrial civilizations who bother to send signals through space will be willing to beam signals of enormous power toward us all the time. That could be true of some, but not necessarily all. • James Benford, Gregory Benford, Dominic Benford, Messaging with cost optimized interstellar beacons. This entry was posted on Saturday, May 18th, 2013 at 2:20 am and is filed under astronomy. You can follow any responses to this entry through the RSS 2.0 feed. You can leave a response, or trackback from your own site. If the superluminary entanglement signal are possible (experiment of Juan Yin) then each natural source of entangled particles can be a communication channel for other civilization (if they exist). The entanglement happen between two civilization that have a couple of particles that was entangled in the past (so that the particles don’t violate the light velocity, only the entangled signal violate the light velocity); a natural source of positrons, or antimatter particles, can be a vertex in a communication channel, and there is not a danger of contact, only an instantaneous communication. The only applications I know of for quantum entanglement in communications are encryption and (the unfortunately named) quantum “teleportation”, and in both cases the possession of entangled pairs by the communicating parties needs to be accompanied by a channel of classical information. So even if interstellar civilisations are making use of entangled pairs, that will necessarily be in addition to some form of signal transmission. That signal might well be very hard to detect for ordinary, private communications, but there might also be cultures who are making a deliberate effort to attract attention, but have a limited energy budget for that purpose. Natural astrophysical sources of entangled particles are unlikely to be very useful for communications. If Alice receives some positrons from a natural source of pair production and Bob receives electrons from the same source, even if some of the particles they receive happen to be entangled (which in itself is unlikely unless they have access to the entire output of the source), they’ll have no way of knowing which are entangled with which. Since they need to send things to each other anyway, they’d be much better off manufacturing and distributing their own entangled pairs. where are the spin-up and spin-down states for particle P.
Suppose Alice has particle A of the entangled pair, along with particle X that she wants to “teleport” to Bob, while Bob has particle B. Given the result of that measurement, if Bob performs the correct operation on particle B for each possible outcome, that will guarantee that after he’s done so, any subsequent measurements on B’s spin degree of freedom will be identical to those you’d get for the original state of particle X. So after Bob receives a classical two-bit message from Alice telling him which of the she measured particles X and A to be in, he can then perform the corresponding unitary operation on particle B … and the result will be that particle B will end up in the same state as particle X was in initially! But Bob can’t do anything until he receives the message from Alice telling him the result of her measurement. Nothing is “teleported” until he performs the correct, matching operation himself, and he can’t know what that is until he has heard from Alice. I suppose that exist a natural production of spin singlet in some part of space. In the EPR paradox the measure of Alice spin collapse the state of the Bob spin. The spin of Alice is random, then the Bob spin is random (no communication possible). Alice can collapse with quick ortogonal measure (x-axis or z-axis), then Bob measure a change in x-spin, and z-spin, measure. I was thinking to a photon polarization (matter-antimatter annihilation), so that an astronomical measure can be simple (polarization transmission), but maybe I changed my mind. Thank you for the clear demonstration. With any quantum state like this, whether it’s a photon’s polarisation or an electron’s spin, there’s no measurement you can perform that will always tell you what the state was. Suppose particles A and B are in a spin singlet state so that their total spin is zero, and Alice tries to send a message to Bob by choosing whether to measure the spin of particle A along either the x-axis or the z-axis. If Alice chooses the x-axis, then both particle A and particle B will have a definite spin along the x-axis. But Bob doesn’t know her choice, and there’s nothing he can measure about particle B that will reveal it. If he measure its spin along the x-axis, he will get some result (positive spin along the x-axis or negative spin along the x-axis). But if Alice had chosen the z-axis, the same two results would still be possible for Bob’s measurement, because any definite spin along the z-axis is also equal to a superposition of the two definite spins along the x-axis. There’s nothing Bob can do that will tell him whether particle B had a definite spin along the x-axis or a definite spin along the z-axis. If he later gets a message from Alice that tells him which axis she chose and what spin she measured, he will learn that if they both picked the same axis, the total spin of particle A and particle B along that axis added up to zero. But without any extra information from Alice, particle B can’t tell him anything. I thought a Gedankenexperiment, some months ago, that has persuaded me that faster-than-light message are possible. I think that it is possible to create a macroscopic entanglement, using a crystal cooled near 0°K (singlet quantum state for the third law of thermodynamics), so that a cut of the crystal (into two equal parts) create a correlated macroscopic wave function (like the EPR paradox, using macroscopic object). I think that each perturbation of one part of the crystal is istantly transmitted to the second crystal (there is a single wave function): it is only a instantaneous switch, but if this is true, then can be generalized to control (for example) a martian robot in real time (or using an intermediate entangled satellite transmitter). This is the reason that led me to write in the blog, a chain of (for me) non-trivial reasoning. Macroscopic entanglement won’t change anything. If you think that entangling lots of atoms in part A with atoms in part B means that, say, shaking part A will cause part B to vibrate, I’m afraid that’s just not true. If you analyse something like this in detail, you’ll find that the expectation value for anything you can observe about part B will be unaffected by anything you do to part A. On my G+ post about this issue there was a commenter who was convinced that quantum entanglement allowed for faster-than-light communication. I told him it just doesn’t work like that, but it seemed to bounce off him. I suppose for someone who hasn’t thought about this much, it’s a fact that requires either a lengthy argument or some acceptance of ‘authority’. But I blame the news media for confusing people in the first place. Why send a radio beam when you can send your kids? We find the optimum total capital costs for a galactic-scale Beacon to be in the range of 10$B. The Apollo project cost about 300 B$ in current dollars, and large science today, such as the Large Hadron Collider, International Linear Collider and ITER fusion reactor, are of order 10 B$. 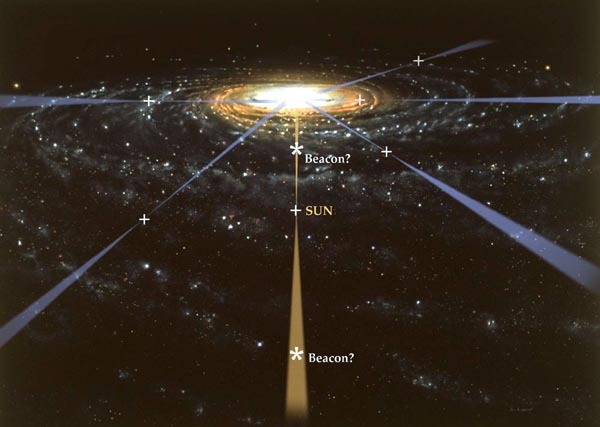 This suggests that galactic-scale Beacons are plausible luxuries. Even sending your kids to Mars would cost more! • Kilroy Was Here. These can be signatures verging on graffiti. Names chiseled into walls have survived from ancient times. More recently, we sent compact disks on interplanetary probes, often bearing people’s names and short messages that can endure for millennia. • High Church. These are designed for durability, to convey the culture’s highest achievements. The essential message is this was the best we did; remember it. • The Funeral Pyre. A civilization near the end of its life announces its existence. • Help! Quite possibly societies that plan over time scales ~1000 years will foresee physical problems and wish to discover if others have surmounted them. An example is a civilization whose star is warming (as ours is), which may wish to move their planet outward with gravitational tugs. Many others are possible. • Leakage Radiation. These are unintentional, much like objects left accidentally in ancient sites and uncovered long after. They do carry messages, even if inadvertent: technological fingerprints. These can be not merely radio and television broadcasts radiating isotropically, which are fairly weak, but deep space radar and beaming of energy over solar system distances. This includes “industrial” spaceship launchers, beam-driven sails, “planetary defense” radars scanning for killer asteroids, and cosmic power beaming driving interstellar starships with beams of lasers, millimeter or microwaves. There are many ideas about such uses already in the literature (Benford & Benford, 2006). The cost in $ for us now is not important. What matters is what kind of behaviour will be favoured (by their economics if you like, but ultimately by natural selection) among aliens with space travel and advanced technologies. The ERoEI of colonising a galaxy is quite big. Sending kids to Mars is silly (though it may happen http://www.independent.co.uk/news/science/video-over-600-people-sign-up-to-live-on-mars-8594348.html). The whole idea of living on the surface of a planet is silly for organisms that have space travel. There is so much more energy and material available for organisms that fragment planets and live on the pieces. It’s weird. I feel that I am thinking biologically, and that I keep seeing physicists who are not thinking that way, and yet I’m really only putting together two ideas from physicists 50 odd years ago (Von Neumann probes, Dyson sphere). As for messages across vast time scales: apart from the funeral pyre, I saw their kids before I saw their message. My point is just that it’s much harder to colonize the Galaxy than send radio messages. The dollar figures for a radio beacon versus colonizing Mars are just meant to illustrate this. Eventually some civilization should arise that can spread through the Galaxy. But we haven’t seen that, so what should we do in the meantime? It seems quite possible that only a tiny fraction of civilizations will reach the point of spreading through the Galaxy, while the rest die out before they do this. If so, there may already be civilizations who have reached the point of being able to communicate across the Galaxy using radio waves, despite the apparent lack of Galaxy-colonizing ones. If so, there’s something easy we can do: listen for radio waves, while keeping in mind the constraints faced by primitive civilizations like our own. I agree, and I constantly inveigh against wasting resources this way. My point in invoking Mars was to point out how hard it is to get there: and this is pathetically easy compared to getting to the next star. So there could be plenty of civilizations that fizzle out before they leave their solar systems. Maybe ours. I estimate that the probability that we will colonise the galaxy within 10My is .98. I’m reading Steven Pinker’s The Better Angels of our Nature at the moment, and am feeling quite upbeat about humanity just now. I would give a lower probability at other times, but rarely below .9. By ‘we’ I mean any human-originated organisms: GM humans, bionic humans, our self-replicating machines, whatever. Note the .98 includes the possibility of extremely painful setbacks along the way. It seems to me that the steps from a radio transmitter level of technology, to an interstellar travel technology, to a star system colonising ability are not huger than ones we’ve made before. And once colonies can make more colonies, and there are at least ten of them, the process is nearly impossible to stop. What are your probabilities and why? Do you think aliens are likely to have much lower chances than us? You have to assume a very small probability to help much with the Fermi paradox. The specifics of Von Neumann probes and Dyson spheres are not important, it is the thinking behind them that is important. The name ‘probe’ is bizarre – life does not probe, it colonises. Dyson spheres as such are clearly silly, but breaking up planets is not. If you believe other strategies are more likely, you need to show how they would outcompete this one. Natural selection has a lot of slack, it produces a large amount of arbitrary morphology and behaviour. But there are limits. If one strategy gives access to 1000s of times more resources than another strategy, it is very hard for the poorly-resourced strategy to dominate. Without assigning any probabilities, I believe that if humanity gets through the next thousand years or so without any catastrophic setbacks, it’s very likely that after a further ten million years our descendants will have some presence across the whole galaxy. As for aliens, for all we know a thousand civilisations might already have placed pebble-sized supercomputers — each one hosting tens of millions of software inhabitants — around every star in the galaxy. But none of this precludes other civilisations, perhaps for some limited portion of their history, operating the kinds of beacons discussed in the Benfords’ paper. While we’re waiting to either meet or become a galaxy-spanning civilisation, we might as well look for the kinds of things we’d have some chance of detecting. Since we haven’t yet met anyone’s kids, it seems perfectly reasonable to invest a modest amount of time and resources on SETI, and on thinking about different approaches to SETI. I’m sure it’s a long shot, but it’s massively premature to write it off as futile, least of all on the basis that Dyson spheres and Von Neumann machines are some kind of “inevitable” endpoint for every space-faring culture. Please join us on Wednesday May 22 at 10am PT for a SETI hangout with Gregory Benford (science fiction author) and Jill Tarter (Bernard Oliver Chair at the SETI Institute) on the Starship Century Symposium. This symposium coordinated by the new Arthur C. Clarke Center for Human Imagination in collaboration with Gregory and James Benford, aims at presenting ideas from science and science fiction. During this hangout hosted by Franck Marchis (Senior Planetary Astronomer at Carl Sagan Center of the SETI Institute) and moderated Adam Mann (WIRED), we will discuss if we could build spaceships to explore the nearby galaxy and the contribution of the SETI research center to this project. Some critics of SETI point to the Fermi Paradox: if smart techno-life is around, why haven’t they spread through the galaxy, then visited our solar system and left easy-to-find artifacts? There are many answers to this. Maybe the alien artifacts are hard to find, or even deliberately disguise themselves. Or maybe aliens much like ourselves find interstellar flight just too hard to do. Studying the size of the problem makes sense, then. Getting a feel for that difficult first step, reaching our nearest star, can make us reflect on how plausible it is to expect galactic colonization. This issue we teased out in the May 21-22 Clarke Center Symposium, and the book it was based on, Starship Century. To get it now, go to starshipcentury.com.